For my first ever photo shoot with my girls, with a real camera (thank you to my sister Haley for letting me borrow her Cannon) I took them to one of our favorite parks, in some super cute digs (thank you Julie for swapping with me) at my favorite time of day. After all my clients picked up their children at five, I had the girls grab a snack, get dressed and hop in the car. Off we went on a spur of the moment Monday night adventure with the promise of earning many marbles for their marble jar if smiles were extra puuuurty Bribery at it’s finest. 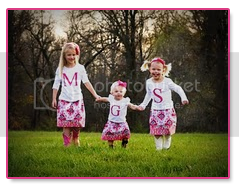 Right before the sun was setting I had the girls frolic around the grassy hill that we took our first family photos back in 2009. They ran, jumped and played patty cake. They also saw a few deer mid shoot! I bet you can guess which photo that was. Overall, I think I did pretty well for my first shoot. If I knew anything about cameras, I think I would have done a lot better, but Julie gave me a few tips and I will forever have this day frozen in time. Which ones are frame worthy? the handclapping shots are priceless! amazing job!! LOVE all those photos - especially the top one, jump, and the final running! You did a great job. Beautiful pictures! Where is this park? Love it! you did a great job! the pictures are amazing. i love their outfits. so cute. you definitely have some frame/canvas worthy shots.